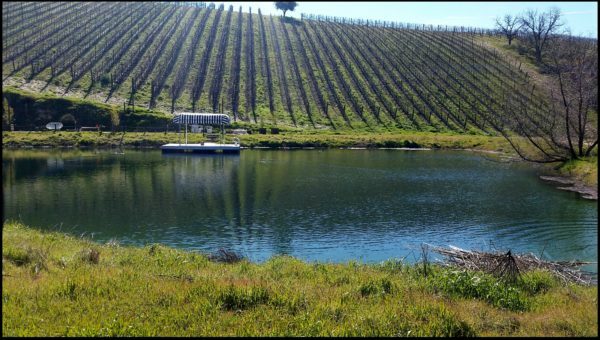 A Dream, A Vision come to life at Alta Colina Vineyards! 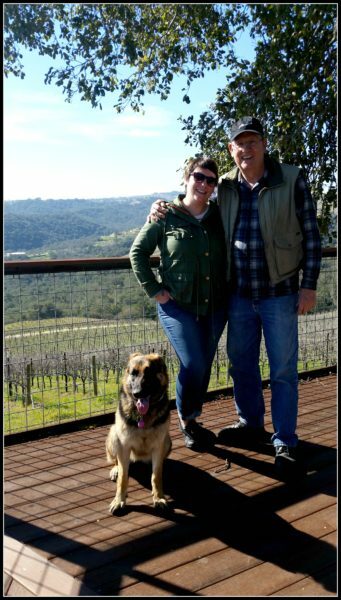 Disclosure: I was invited out to Alta Colina Vineyards in Paso Robles where I met Bob and Maggie Tillman over lunch at their property. We took a tour, talked wine, as they shared their story. This was my experience. This was my 3rd visit to the Paso Robles Wine Region. With each visit I discovered new properties, new tidbits about the area, and met amazing winemakers and wines in the process. BUT, as I set foot onto Alta Colina, I knew this visit would be a bit different. And it definitely was. As Bob and Maggic walked out with their dog Honey, and asked me to hop in their pickup truck, I knew it was going to be an adventure. 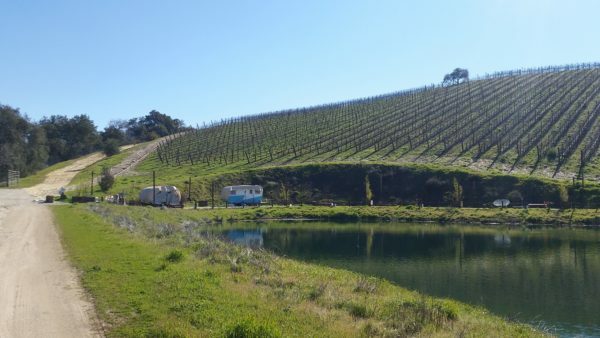 Prior to coming here, a few months back, Alta Colina had teamed up with Tinker Tin Trailer Co at their property around their “Trailer Pond,” to bring a new kind of camping experience for the wine lover. There are 6 Trailers you can rent out and camp in during the year right on their vineyard property. I was looking forward to seeing this in person, and see this vision come to life. As we hopped in the pickup truck, we began trucking up the road to their vineyard property. TRUST ME on this, you have to drive up the estate, otherwise it would be quite the walk and adventure, otherwise. Their property lies 1800 Feet about Sea Level. Their Vineyard lies within the hillside of the Adelaida District. Alta Colina means “high hillside” in Spanish, quite fitting of the property. While in the pickup truck I asked how they found their love of wine? Maggie’s response was perfect, “oh, it’s always been there.” Needless to say, Bob has always had a love of wine. He was an engineer during the day, and a home winemaker at night. In 2003, he finally began to look at properties to make his TRUE vision come to life. As Bob looked out at the view, as we stopped to take in the view, I could still feel the sense of wonder he felt when he first set foot on that property. 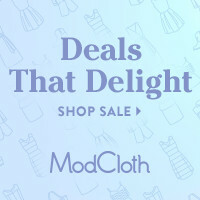 The view is fantastic, and it is quite the site. He found this property back in 2003, and the minute he walked it, he knew it was the one. 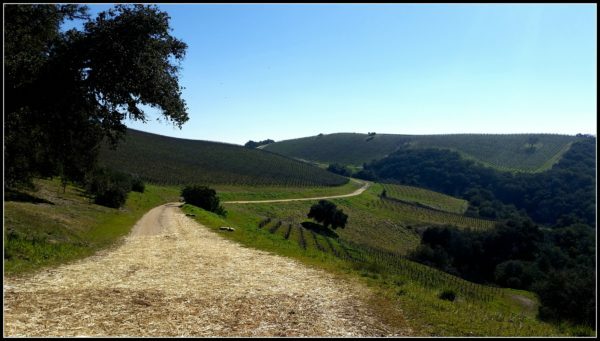 Today, known as one of the best views throughout Paso Robles. We hopped back into the Pickup and drove further through the property when I first set my eyes on the Trailer Pond: During my visit, most of the trailers were taken into Storage due to the heavy rains the area has been receiving the weeks prior, but 2 were still out around the Trailer Pond. I mean, think about it. 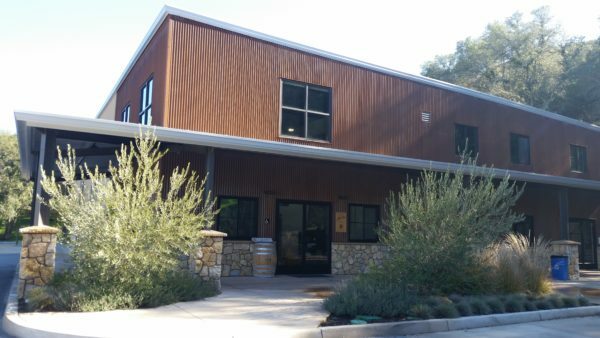 You’re wanting an incredibly unique wine experience: How more unique can you get than staying inside a trailer right next to a Vineyard with many Tasting Rooms and Wineries surrounding you all around Paso Robles? Lets talk the Wine. Paso Robles has been known for their Rhone Varietals and GSM blends, and it is no different at Alta Colina: they concentrate on Rhone Varietals such as Voignier, Marsanne, Grenache, Syrah, Petite Sirah, and Mourvedre. And, Bob, has made sure, that the majority of the work, for the wine, happens in the vineyard. That’s what truly makes a wine. And the property at Alta Colina speaks volumes as to the kind of wine they produce. If you’ve been curious about the beauty of a Paso Robles Syrah, this is definitely the wine I’d recommend for you. 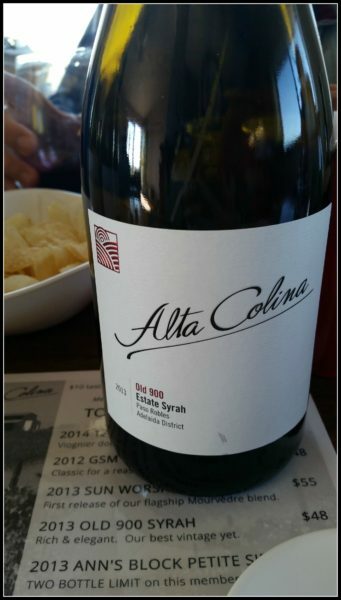 The Old 900 Estate Syrah really spoke volumes to the property at Alta Colina, but also, to the beauty of a Paso Robles Syrah. Truly, an everyday drinking wine, as well, that would be a GREAT component to any red meat meal. 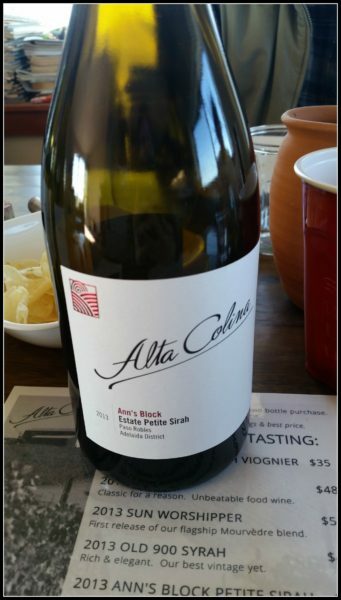 The second wine that really stood out to me was the Estate Petite Sirah from Ann’s Block. Ann’s Block, paying tribute to Maggie’s Grandmother. But, this wine was truly a beauty, and one truly worth taking home. They also had a White Voignier, a Marsanne Cuvee, GSM, and their Sun Worshipper (which truly highlights Mourvedre, for those Mourvedre lovers out there!) 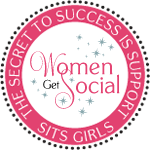 For more information on their wines, visit here. Tasting: In the tasting room, for just 10 dollars, partake in a wine tasting of 5 Varietals of their wine. 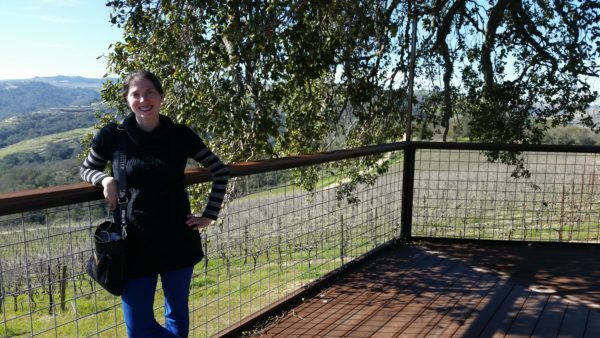 2 Responses to A Dream, A Vision come to life at Alta Colina Vineyards! This winery looks lovely! 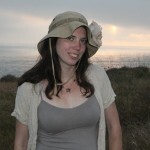 I went to Paso Robles for the first tie this year and loved it. Your photos make me want to have another trip asap! Great location, wonderful story and photos.. and the wines sound really great.